A fine portrait of a bearded Scotsman hung on Jane Cameron’s wall at the Archives. It was her grandfather, William Keith Cameron (WKC), who came to the Falklands in 1867 and obtained land at Port San Carlos. This was where Jane Diana Mary Keith Cameron was born on 12 January 1950. Her father Norman Keith Cameron was the son of WKC and her mother Anne Henniker-Heaton was the daughter of Sir Herbert Henniker-Heaton, who had been Governor of the Islands from 1935-1941. Jane grew up at Port San Carlos in a secure and loving family: she was the eldest of four children, the others being Alastair, Donald and Susan (Sukey). In May 1952 she flew with her parents on the Aquila Airways flying boat to Montevideo at the start of a leave visit to England. Jane was educated at home until 1961 when she left for school in England. She first went to Southover Manor School at Lewes and then to Padworth College in Reading. On school holidays and later university vacations she stayed with her mother’s sister Priscilla (Bunny) Ballantyne, whose home in Kent became a base for all the Cameron children during their education. Jane studied modern history at the University of East Anglia in Norwich and on graduating devoted herself to paper conservation and bookbinding. She was apprenticed to the well-known bookbinder Sydney Morris Cockerell at Grantchester. Together with three other dedicated young ladies she was restoring most delicately the fragile pages of ancient books. Some of the pages were gossamer thin and I was amazed that they could be, so to speak, brought back to life. Jane’s enthusiasm for this work was evident. 1983 and took a number of government posts finally becoming Director of Fisheries. His encouragement brought Jane south and she returned permanently to the Islands in 1989. Jane’s world was one of sepia albums, used coffee cups and hand-written despatches bound in leather. Her work was a tangled forest of family trees and rusting dwellings; she lived on a diet of punk rock and toast. Things improved and were to pick up dramatically in 1998 when the new archives building was completed close to the Museum. In addition to storage facilities with controlled temperature, there was a reading room and a conservation workshop. The total cost was considerable and the fact that Councillors found funds for this project when there were numerous other priorities was a tribute to their high opinion of Jane and their confidence in her capability as government archivist. With the completion of the Archives Building, it became possible for scholars to work on the 160 years of records produced by the Falkland Islands Government and the fruits of their work became apparent in a far higher and more detailed level of historical research in the Falkland Islands Journal and other historical works. Scholars came to the Archives from Britain, Ireland, the continent of Europe and even Argentina. The archives building attracted other collections of papers, most notably from the Falkland Islands Company, but also local journals and even the minute book of the short lived Stanley Cricket Club. I was working in the archives in 2006 when Jane burst in, delighted to have secured the order book of Stanley’s principal dressmaker in the 1940s. History for her was a total experience, not limited to the sober documents of government. enthusiastically took up the cause of the refurbishment of the much neglected lighthouse and the surrounding area. In this she was highly successful, though not without having gamely to overcome some dispiriting obstacles along the way… The fact that the lighthouse, with the small museum she set up in it, and area round it are now considered such attractive places to visit owes much to Jane's dedication to the Islands and her hard work, flair and imagination, and will be another lasting memorial. I made her dream come true; I still don’t know how I did it but she was the inspiration! She made me proud to win a battle against wind, cold temperature and heights. With the support of Councillor Norma Edwards, Jane established the Historic Buildings Committee and set out on expeditions to preserve the Islands’ historic buildings – the missionary settlement on Keppel Island, the community centre at Goose Green, various corrals, a sheep dip. She had a great affection for corrugated iron, but also prescribed modern claddings which would preserve the character of Stanley’s buildings while still keeping them waterproof. (Rob IJssel’s neat model of typical Stanley barge-boards in Falklands House in London was inspired by Jane’s affection for the Islands’ domestic architecture). The “central stores” in Stanley dockyard, the oldest building in southern America, was re-clad with new shingles thanks to Jane’s advocacy. In 1995 she joined Admiral Kit Layman in editing a collection of letters from a Victorian ancestor of his – also a naval officer. The Falklands and the Dwarf recounts the voyages of Captain Wiseman among the Islands in the 1880s and is enriched with Jane’s footnotes picking up the various local references. 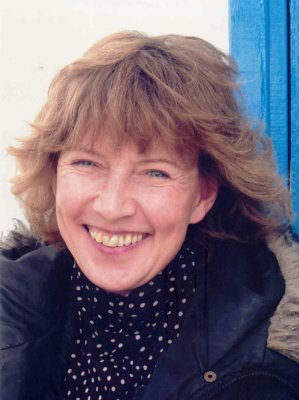 She helped most other authors of Falklands books: Joan Spruce with Corrals and Gauchos; Tim Simpson with The Falkland Islands Cookbook; Graham Pascoe and Peter Pepper with The Falklands Saga; and many of the 170 contributors to the Dictionary of Falklands Biography. Her latest project was a dictionary of Falklands words and expressions which she was preparing with Joan Spruce and Sally Blake. preserve a bit of what was left at KEP and to concentrate some minds on South Georgia’s history. In November 2009 Jane was fully established in Stanley. She had a comfortable house – The Old Bakery – on Fitzroy Road where she lived with her partner Rob IJssel. It was furnished in an eccentric and engaging style, thanks to Jane’s appetite for antiques and Rob’s skill as craftsman extra-ordinary. Her red Citroen 2CV was one of the sights of the town. She might have been approaching retirement age, but there was no doubt that she would continue to work on the Falklands’ past for many years yet. When she was offered a voyage as adviser by a Dutch television company making a documentary on Charles Darwin’s ship Beagle, it seemed an opportunity too good to miss. Yet it was on a shore trip from that cruise that she was gravely injured in a traffic accident in the Argentine town of Trelew. For over a month family and friends kept a vigil by her bedside and sent e-mail reports to her friends and colleagues all over the world. The tone of the reports gradually shifted from optimistic to non-committal and by mid-December we began to realise that Jane might not recover from her many and severe injuries. She died on 26 December 2009 and, after a service of Memorial and Thanksgiving in Stanley Cathedral on 11 January 2010, was buried on 17 January at Port San Carlos, next to her brother Alastair, who had also died tragically in a road accident in the Islands twenty years before. Jane’s knowledge of Falklands history in unmatched and she has been very generous to me and to every other contributor who sought her help. The Dictionary simply could not have been completed without her. It was no less than the truth and a tribute from a project to which she contributed 14 articles. Thoughtful, sensitive, enchanting and extremely funny, Jane was blessed with immense charm and a smile that could melt an iceberg. And for those of us who earned her disapproval she was armed with a brief but armour-piecing glare. I still find her comments in my DFB files, wise, witty, encouraging but expecting high standards – a souvenir and a presence. All readers of the FIJ will share the sense of loss felt by her family and indeed by everyone on the Falklands. We send our deepest sympathy to her brother Donald and his family, to Sukey and Howard Pullen and to Jane’s partner Rob IJssel.